NEW YORK – Chinese artist Cai Guo-Qiang (surname pronounced tsai, given name pronounced gwo chang) draws and paints with gunpowder and uses fireworks to create powerful art events. “I Want to Believe” is the first comprehensive retrospective of the artist’s work; it is on display at the Guggenheim Museum in New York. Besides his museum work, Cai is directing the fireworks for the opening and closing ceremonies of Olympic Games in Beijing. “I Want to Believe” features eight of Cai’s installations created since the early 1990s along with early works, gunpowder drawings, videos of explosions and social projects. 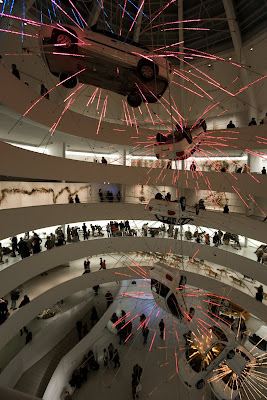 The show features a copy of “Inopportune: Stage One ( 2004),” composed of nine white Ford Tauruses pierced with blinking light tubes that simulate the trajectory of a carbomb explosion tumbling up through the atrium’s void. It’s a dramatic work about the dialogue of art and war, a common theme in the work of this New York- based Chinese artist who came onto the international contemporary art scene while living and working in Japan. One of Cai’s more controversial installations is “Venice’s Rent Collection Courtyard (1999)” for which the artist was awarded the Golden Lion at the 1999 Venice Biennale. For this retrospective, Cai created a new version called “New York’s Rent Collection Courtyard (2008),” inviting 12 Chinese sculptors to recreate the seminal work from 1965, which was created by artists from the Sichuan Fine Arts Institute. left unfired, allowing them to dry, crack and disintegrate during the exhibition. Community involvement is also evident in “Reflection – A Gift from Iwaki (2004).” It features a replica of a sunken ship that Cai found on the northeastern coast of Japan and excavated with help from the local community. Many of the same rescuers traveled to New York to install the ship. “Head On (2006)” features 99 realistic-looking wolves running as a pack into an invisible wall and tumbling bent and broken to the ground. “Cry Dragon/Cry Wolf: The Ark of Genghis Kahn (1996)” is a flying dragon made from sheepskin bags, branches, paddles and rope and poweredby Toyota engines. Another installation that features a traditional Chinese story is “Borrowing Your Enemies Arrows (1998).” Thousands of arrows pierce a Chinese fishing vessel from near Cai’s hometown of Quan Zhou. The title is from a Chinese story about a general who is forced to make a thousand arrows or die. To fulfill his obligation, he sends a boat filled with grass figures into enemy territory and then collects the arrows shot into the boat to use in battle against the enemy. Much of Cai’s work is about destruction. But in Cai’s art, destruction does not lead to elimination; it leads to creation. artsjournalist@centurytel.net Leanne Goebel visited the Guggenheim Museum as a project of the Creative Capital/Andy WarholFoundation Arts’ Writers Grant Program.